This work celebrates the wonder of light and colour. The title refers to the moment when something suddenly ‘catches’ our eye by ‘catching’ the light, thus creating a heightened perception of light and colour, which all too often we take for granted. The eye perceives the colour of an object before the finer details of its shape and lines ; and this all the more vividly at certain times of the day and the year, when atmospheric conditions make colours sparkle, or the contrast between light and shadow almost blindingly stark. We can recollect this experience in our mind’s eye, but capturing the dynamics of the glance remains a challenge for photography. Catching the Light seeks to recreate the vibrant, fleeting intensity of that sensation and was conceived in the spirit of early photographic experiments with minimal subsequent manipulation. The twelve photographs included in the book were nevertheless made with the latest technology, and each of the images serves to illustrate one of twelve steps from violet to magenta along the spectrum of the RGB colour space in Adobe Photoshop. The book itself is made in such a way as to engage the viewers’ attention and imagination, by allowing them to handle the images, vary the order of presentation and view them from different angles. 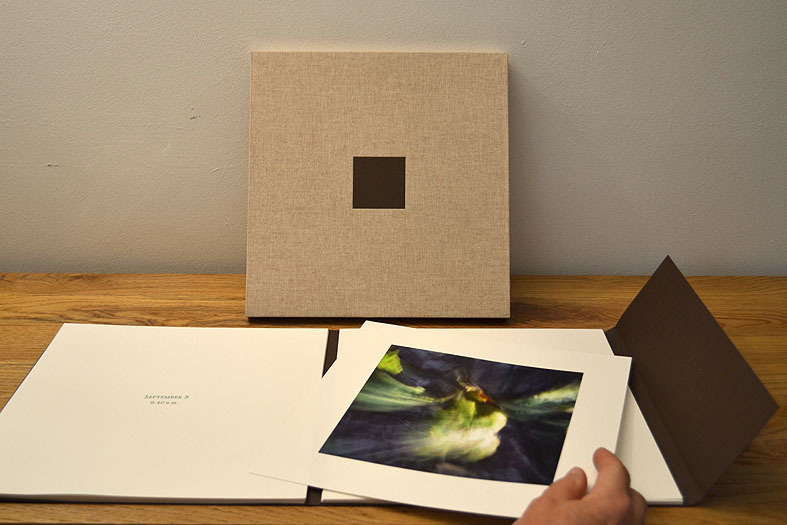 The book consists of 58 pages including 12 tipped-in pigment ink photographic prints and this handmade edition consists of 12 numbered copies. The 12 photographs were printed on a Canon Pixma Pro-1 inkjet printer using Lucia pigment inks and Canon 260gsm semi-gloss photo paper. The text stock is Fabriano 4 Liscio 220gsm and the cover is 260gsm fluted card. The slipcase was made using 3000 micron conservation board covered with No. 2 crash canvas by Phil Cockburn.